Following our interview on the Armchair General site, here is a is a new batch of screenshots from the recent builds of Red Pill. Some of these shots were used in the interview article; others were left on the cutting floor (hence the captions). Click on the images for full-size. 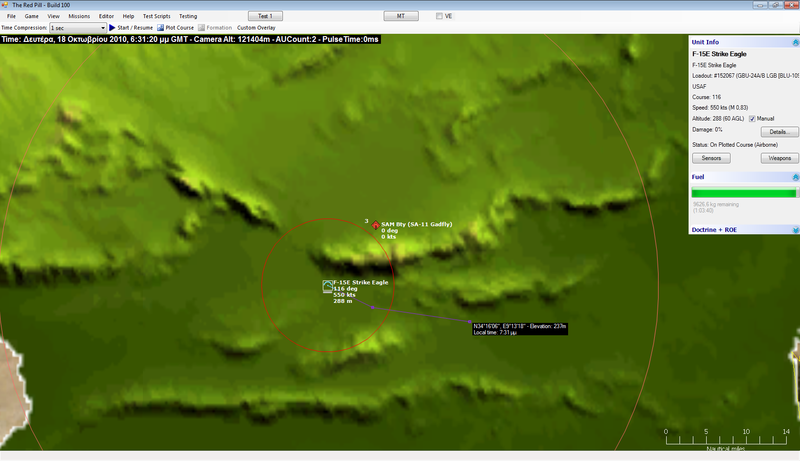 Raptors on the prowl: A pair of F-22 fighters are using stealth, speed and their highly-sensitive passive ESM sensors to detect, triangulate and silently attack a fighter screen composed of Su-30MKIs. 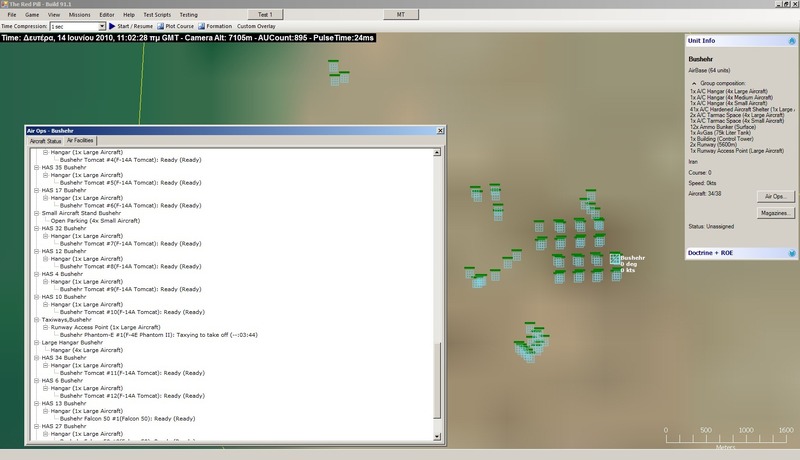 …but with just a few clicks the player can fill the screen with windows providing every kind of information. 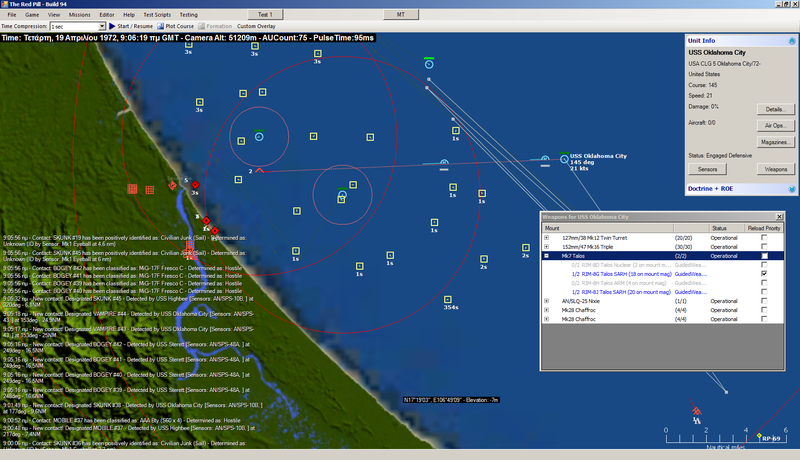 All supplementary windows can be moved to a second monitor to unclutter the main map. 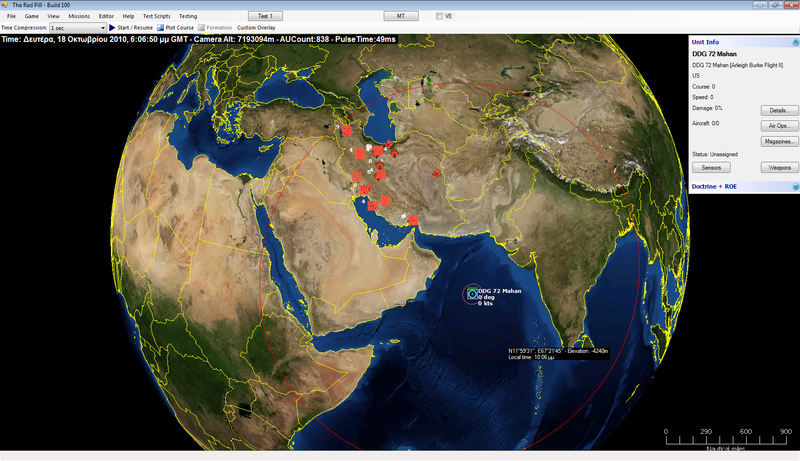 Global Reach: The destroyer Mahan demonstrates how, while still in the open Indian Ocean, it can strike at any of a large number of important Iranian military facilities with its Tomahawk cruise missiles (red range-ring). Hug the terrain: An F-15E stays low and uses a mountain ridge to mask itself from a dangerous SA-11 SAM battery on the other side. Busy day: Overview of air operations at Bushehr airbase. Most aircraft are in their shelters/hangars, while some are busy taking off, landing or moving between the main runways and the parking facilities. The "Unit Info" displays a summary of the available facilities in the base. 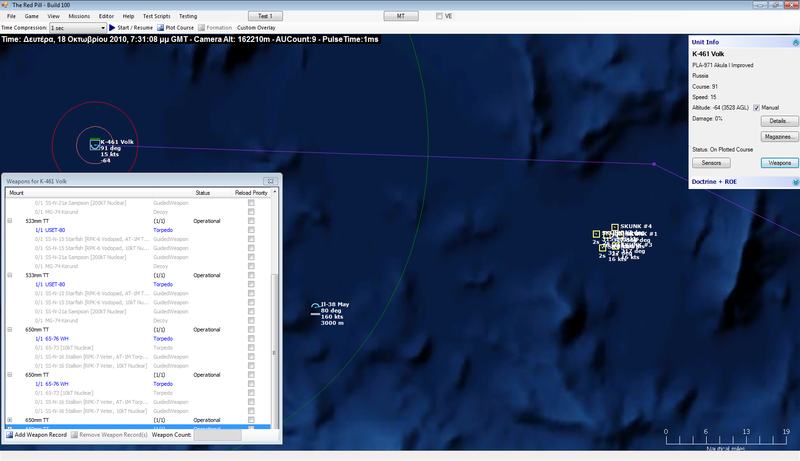 Sharks of steel: The Volk, an improved Akula-class submarine, has entered the Tyrrhenian Sea and is setting up for attack (with tracking help from a prowling Il-38) on an Italian formation centered on the carrier Garibaldi. Based on the weapons available, the first attack will probably be a pair of heavy wake-homing torpedoes, followed by two wire-guided ones. 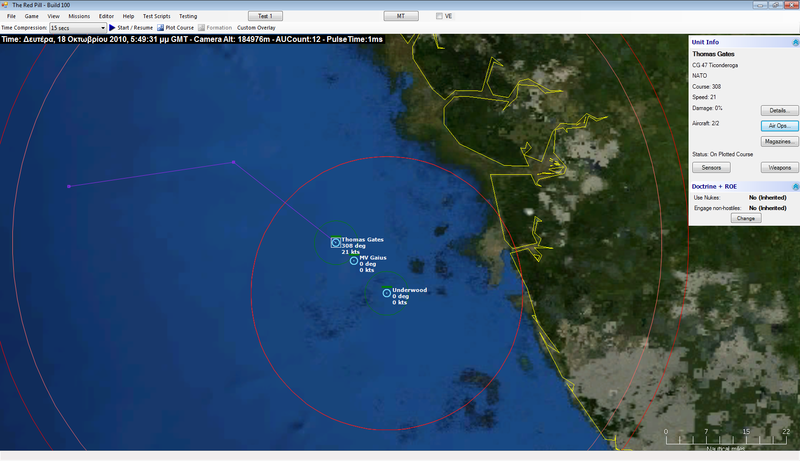 Battle of Dong-Hoi: The cruise Oklahoma City is engaging a quartet of incoming MiG-17s with her Talos missiles in a recreation of this Vietnam-era skirmish. 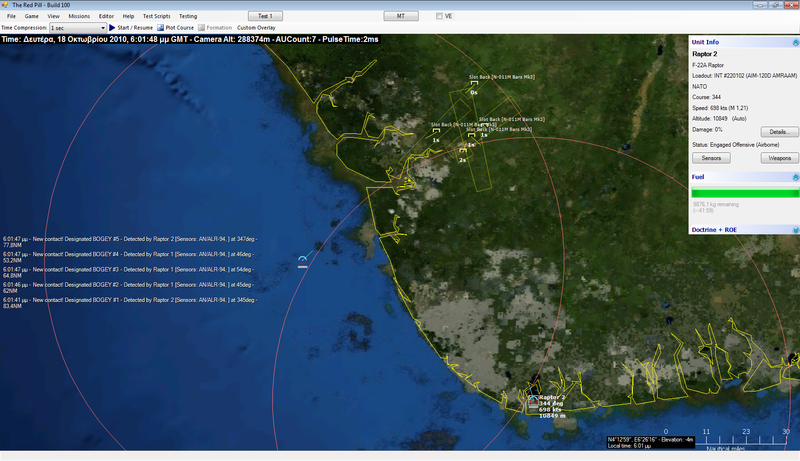 Eye in the sky: Players and scenario editors alike can use satellite image overlays to enhance their sim experience. 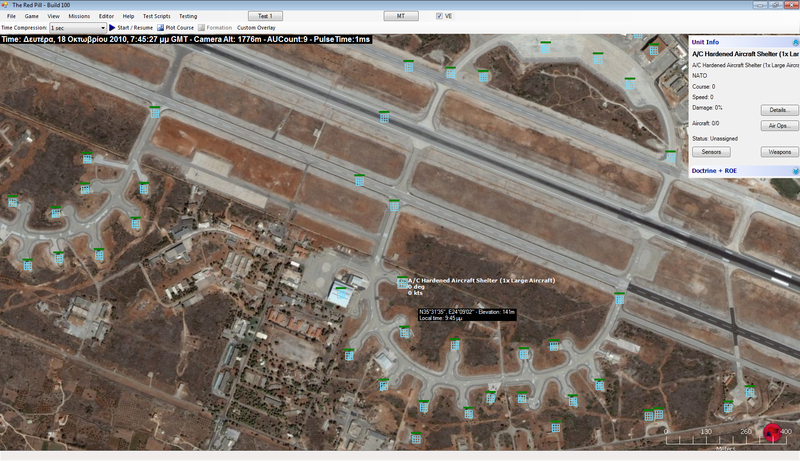 This is a close-up of some of the facilities on Souda Bay airbase, Crete. 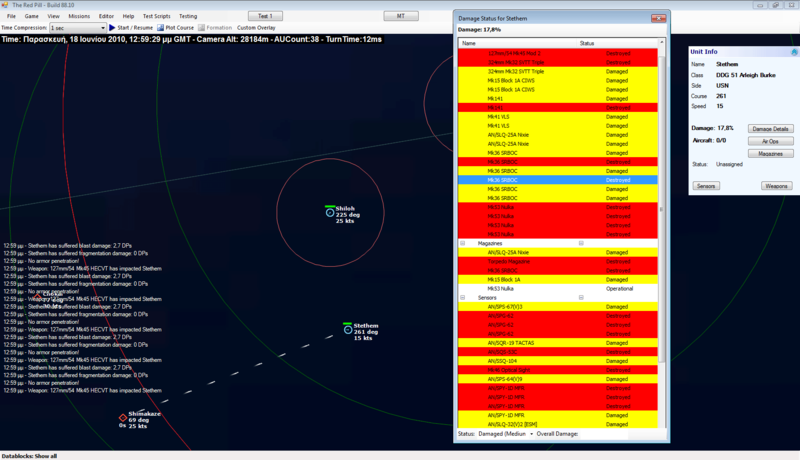 Thick screen: Red Pill’s scenario editor allows the easy import/export of large numbers of accurate, detailed facility complexes. 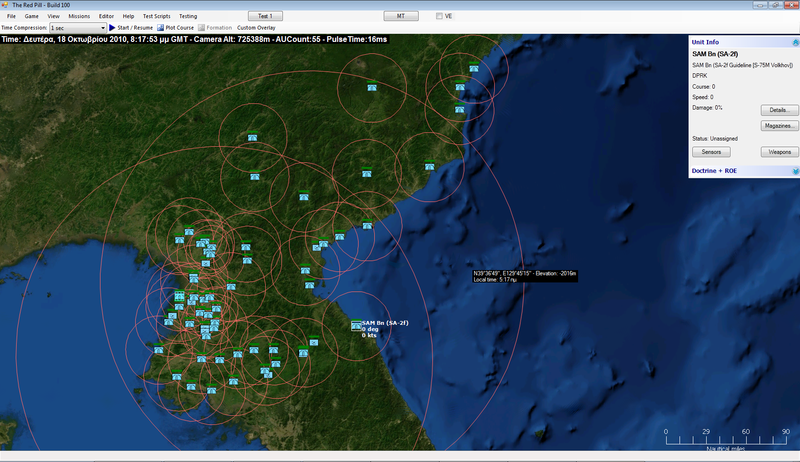 This is an overview of the radar and SAM defences of North Korea. 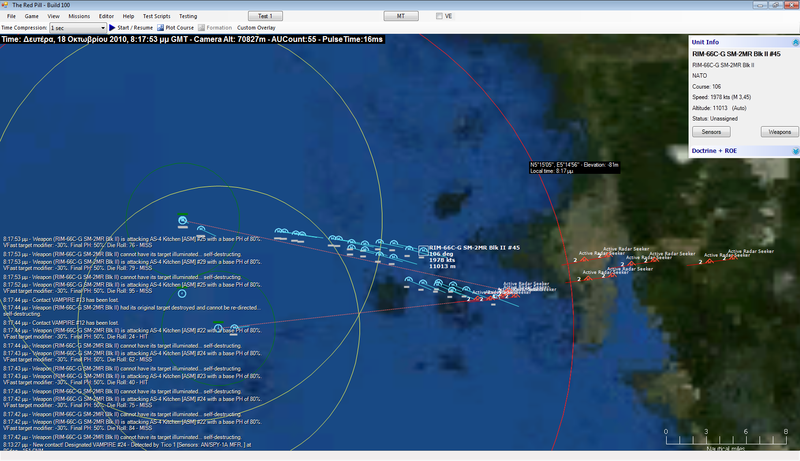 nevertheless are playing havoc with the Stethem’s exposed weapon & sensor systems. The damage status window depicts this clearly enough: The Stethem is effectively out of the fight. If you think Red Pill is a simulation game of the pharmaceutical market, think again. 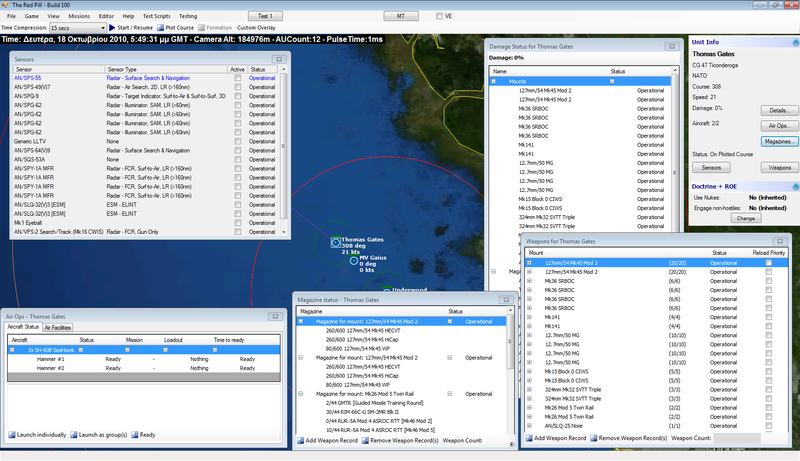 Red Pill is the working title of a highly detailed wargame of air/naval operations that is being developed by Warfare Sims. 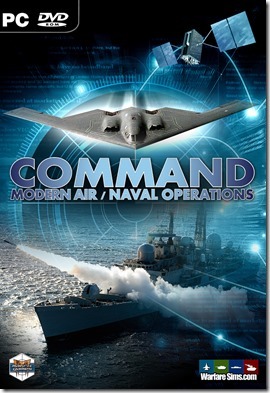 Imagine a cross between Harpoon and the Modern Air Power series and you are close.